The Festival is held at Mansfield (Massachusetts) High School and the adjacent Mansfield Middle School, located in the town of Mansfield, MA at the intersection of I-495 and I-95, southwest of Boston. Address: 250 East Street, Mansfield, MA 02048. In 0.6 miles, follow your choice of options from below for parking. On-site Festival parking is limited. Please consider carpooling! 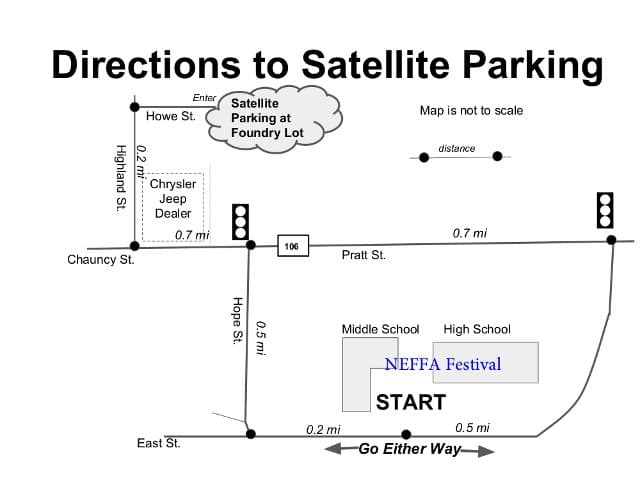 Festival parking is in two areas: the school complex parking lots, and satellite parking. Handicapped parking is always available at the festival site in front of the High School. Drive directly to the Festival site, which will likely handle all attenders. If full, cars will be sent to satellite parking and shuttle busses activated. Parking advice: Saturday and Sunday. Festival site parking will be full around 10:00 am Saturday and 10:30 am on Sunday. After that, drive directly to satellite parking. Shuttle buses run 9:00 am on Saturday and Sunday and end about 30 minutes after the Festival closing time. Some spaces open up at the Festival site during the day (mostly mid-afternoon) so you can try your luck there if arriving later in the day. ALERT: Our satellite parking lot has a new location! We are using “Foundry Parking” near the Mansfield MBTA station. Courtesy of the lot’s owner, Bill Clemmey, the lot is available and *free* on the Saturday and Sunday of the Festival (April 13-14, 2019). From Route 106 in Mansfield, turn onto Highland Ave., and then take a right onto Howe Street, then straight into Foundry Parking. Please park responsibly. Pick up the free shuttle bus at the marked stops. In about 1.8 miles, turn right onto East St. The nearest commercial airports are Logan International Airport (BOS) servicing Boston, and T.F. Green Airport (PVD) servicing Providence RI. From PVD: There is MBTA (train) service from PVD airport (see www.mbta.com); look for service to Mansfield Station. Please note, this service picks up at the airport only on Fridays. Also please be aware that the Amtrak code for Providence is the same as the airport code (PVD), although the Amtrak station is nowhere near the airport, causing some confusion during travel planning. Airport Ground Transportation – A cab or airport limo is possible. The low cost alternative would be to take a train or bus to the Providence RI train station, then take the MBTA Commuter Rail three stops to the Mansfield Station. From there, pick up the free shuttle bus (on Mansfield Av. / Crocker St. near the station house) to the Festival. See this map of the station. From BOS: Airport Ground Transportation – A cab or airport limo would be expensive. The low cost alternative would be to take the MBTA Silver Line from the terminal to South Station, then MBTA Commuter Rail to Mansfield (Providence line). From there, you would pick up the free shuttle bus (the bus stop is in the parking lot near the rear of the platform)! Mansfield is served by Amtrak and the MBTA Commuter Rail. The station is Mansfield (Providence line), and the schedule is not great. In fact, you would do well to check in at the Information Table when you arrive to try to arrange a ride back home after the Festival. From the South/West, travel to Providence Station (PVD), and take the MBTA Commuter Rail to Mansfield. From the North, take the train into North Station, Boston. From there, you need to transfer to South Station (via taxi or ride-share) and then Commuter Rail to Mansfield. From there, you would pick up the free shuttle bus (two bus stops: One in the parking lot off the platform towards Providence, and the other on Mansfield Av. / Crocker St. near the station house) to the Festival. See this map of the station! A local cab company is BILL’S TAXI. Contact them ahead of time at (508) 697-4343 to arrange for a pickup. Consider using Ridebuzz.org, an organization based in the Pioneer Valley of Massachusetts. They seem to be well-organized and active.